Operated by Tyrolean Jet Services, the Airbus ACJ319 features lounge areas at the front, a bedroom with ensuite bathroom in the middle, and additional seating at the back. Airbus will display an Airbus ACJ319 at Jet Expo, allowing company executives, billionaires and government officials to see for themselves the widest and tallest cabin of any business jet. 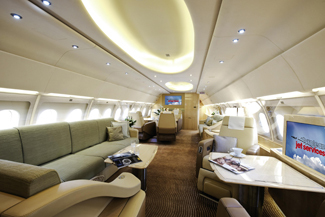 Operated by Tyrolean Jet Services of Austria for a private customer, as well as on vvip charters, the Airbus ACJ319 features lounge areas at the front, a bedroom with ensuite bathroom in the middle, and additional seating at the back. It is certificated for up to 19 passengers. “Airbus corporate jets occupy the same ramp space as other large corporate jets, but it's another world inside, because they have by far the widest and tallest cabins of any business jet,” enthuses Airbus chief operating officer, customers, John Leahy. “Private jet customers want to give wings to their lifestyle, and Airbus corporate jets deliver that better than anyone else,” he adds. Airbus corporate jets are derived from the world's most modern airliner family, providing an unequalled combination of comfort, space and freedom of movement, as well as the widest spread of capacities and ranges for top-end travellers. Their modern designs make them best placed to deliver innovation, from the latest entertainment, such as high-definition TV, to the new operational enhancements, such as runway overrun prevention systems (ROPS), as well as investment value. Airbus corporate jets also benefit from the robust reliability demanded by the world's airlines, plus a global support network serving the needs of more than 500 customers and operators, including services tailored to the specific needs of corporate jet operators. They were the first business jets to fly on every continent, including Antarctica, have won over 170 sales to date, and continue to set new standards in business aviation.